I ordered the blue Luxury Lightweight. The quality is very nice loved the color it goes extremely well with my room. What i really like is its very light weight because i get extremely hot at night but my girlfriend gets cold so she stays warm and i stay cool. Outfit your sleep space with this conveniently packaged bed in a bag set. Soft, lightweight microfiber is airy and luxurious against the skin, lending itself to year-round weather wonderfully. A variety of classic color options will blend in with your decor. Dimensions 20.0 In. X 20.0 In. X 10.0 In. Great Luxury 5 piece bed in a bag set. It had everything I was looking for and needed. 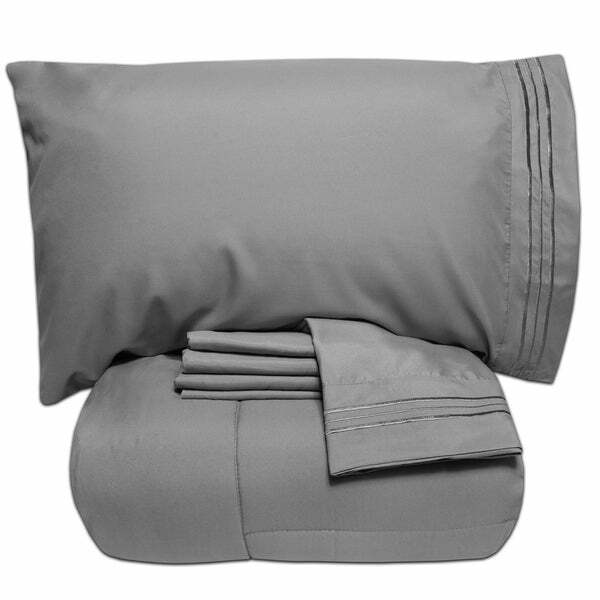 I ordered the full set and it came with Comforter, Flat sheet, Fitted sheet and 2 Pillowcases. The comforter is not too thick or thin. Loved that they have many different colors to choose from. Price was great and the shipping was fast. Good product. Fits perfect on bed. And sheets are perfect. I loved the packaging of the product. Comforter came in its bag and sheets in another brand. It looked like I purchased the set at a expensive beding store. Not to say the sheets feel so soft. We just re-did my daughter's room. She wanted an all white comforter set. They're hard to find at a reasonable price. This one fit the bill. The comforter is soft and warm. The sheets are comfy. It all washes well-no shrinkage. Great value. We were in the search of a nice quality sheet set for our guest bedroom. I was looking for something that was simplistic yet still had that luxurious feel to it. Let me tell you this sheet set did not disappoint. The fabric has a luxuriously soft feel to it. I washed it as soon as I received it in the mail. After washing it didn’t not seem to wrinkle and held together nicely and as far as the softness went it seemed to only get better! I’m glad and very happy with my purchase! Thanks Overstock! The comforter is thick and luxurious. It feels like it should have cost three times the price. The sheets and pillowcases are also a dream. So soft and the fit is perfect. These sheets are of superior quality and very luxurious and soft. I read the reviews before purchasing and I am very satisfied with my purchase. I would expect sheets like this to be much more expensive than what I paid. First of all the price on this item is reasonable, and it was packaged with durable material so it doesn't incur any damages while delivering, I love the feel of the sheets, it has detailed trimmings on the pillowcases that adds elegance, I bought the queen size and it fits perfectly, the comforter is not too thick but it works well for me, it can be washed in a medium sized washer with ease. arrived on time. good purchase. This set was okay. The comforter is not thick at all, but the sheets seem soft. The comforter actually reminds me of the down alternatives in a hotel that are placed under another comforter. In my opinion, this shouldn’t be used as someone’s only bedspread. I am very particular about what I order online. I really love the bed set. I purchased for my grand daughter’s room. Very good quality for the price. I was surprised bu the great quality of this set. Soft and fluffy. Sheet set is superb. I would definitely recommend this set. White gives a nice clean look. I ordered these for the guest room because they give the room an hotel-like vibe. Also because they look so sharp and clean. My guests assured me that they were very comfortable. Very good product for the price. We bought two sets and after the first set was not as pristine it made for a good bed set for our guest room. Another Christmas gift. The color is perfect - exactly what we were looking for. The price was great and the quality seems like it will hold up. "Is this true to size or should I order a size up?" "What is the tread count??"